DAWEH CONGO has propelled himself to the forefront of conscious heartical roots reggae with his newest album Human Rights & Justice. Released by Roots and Culture Records earlier this year, Human Rights & Justice personifies the essence of JAH music today. Daweh's voice and his righteous livications for Rastafari and Marcus Garvey often result in his being compared to 1999 Grammy winner Burning Spear. On Human Rights & Justice, Daweh exalts his spirituality with such incantations as "Jah Is My Shepherd", "Wilderness", "Drums" and "Jah Mercy Seat". His cries for a better world can be heard on "One World", "Earth Running" and the title track. Daweh Congo recruited the formidable talents of "Roots Radics", Jamaicas premier back-up band to lay the rhythms that can be heard throughout this album. The heavy drum and baselines from Style Scott and Flabba Holt, along with Daweh Congos mesmerizing voice have catapulted Human Rights and Justice to the number one position on IREGGAE.COMs top ten albums for the month of May. Daweh's debut CD "Militancy" was released on RUNNetherland Records in 1998. Produced by Barry O'Hare, this release features conscious itations such as "Study Garvey", "Coconut Chalice", "No Peace" and "Militancy". Born "Rohan Graham" in 1969, Daweh's father cut sides for Joe Gibbs and Lee Perry. Daweh recorded his first song "Breadwinner" for Alton Ellis. In 1995, he teamed up with Ocho Rios based producer and managing director Barry O'Hare, to record his first hit singles "Study Garvey" and "Coconut Chalice". The words and thoughts of Marcus Garvey are featured prominently on "Militancy", an album that strikes a chord amongst rastafarians and reggae enthusiasts. 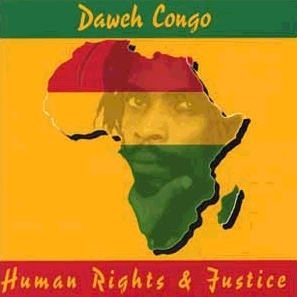 Daweh Congo continues his spiritually charged and uplifting lyrics on Human Rights & Justice. Produced by Gayland Bravo and distributed in the US by Ernie B's, this album features 45 minutes of pure conscious reasonings that are sure to uplift the hearts and souls of roots music lovers all over the world. Perhaps the greatest compliment I have heard regarding this album to date came from Positive Massive Sound recording artist "Rocker-T" who stated "I could play this entire album for my bredren, and most of them would not believe me when I told them that it was not Burning Spear." Daweh is preparing to embark on a tour of the Unites States in support of his incredible new release. Dont miss the opportunity to see Daweh Congo when he comes to your town, and please do your part to secure Human Rights & Justice for all mankind.